IDC predicts that the global data-sphere will balloon to nearly 163 zettabytes by 2025 – nearly ten times the amount of data generated in 2016. Of that 2025 figure, unstructured data is estimated to comprise over 80 percent, meaning object-based storage will be an invaluable tool for data-heavy organizations moving forward. However, object-based storage systems aren’t a one-size-fits-all choice. 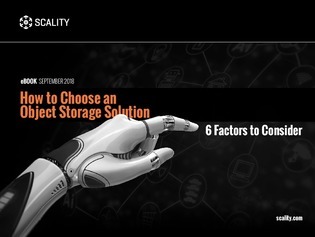 Inside this white paper, learn the six factors to look for in an object-based storage platform to ensure it can properly scale to future data volume growth, cloud environment expansions, and more – and without incurring massive costs.